San Remo is the capital of the Riviera of Flowers and this can also be seen in its artistic and architectural style. The town is essentially Liberty (Art Nouveau) in style, as its hotels, villas, and Casino clearly testify. During the “belle époque” period, San Remo experienced a moment of great and refined housing boom: 190 villas and 25 hotels were built from 1874 to 1906. Some of the most luxury hotels changed their “activity”, but their charm is still intact. For instance, the Town Hall is housed in what was once the splendid Bellevue Hotel, while the former Riviera Palace Hotel now houses the Tourist Office. But the Liberty style went hand in hand with eclecticism at the end of the nineteenth century. 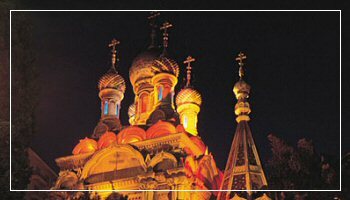 However the Orthodox Russian Church is not eclectic, despite its first appearance. The Church was consecrated to the Saviour and St Catherine and is a fairly eccentric monument. Towards the end of the nineteenth century, many Russians decided to spend their winters in San Remo and this was due to the tsarina Maria Alexandrovna who spent an unforgettable winter season in San Remo in 1874 and then “promoted” it once back to her country. The Church was finished in 1913 and it is slightly similar to the church of San Basilio in Moscow. If you want to find other interesting buildings and works of art, then you need to go into the heart of the town and, for example, walk along Corso Matteotti. Here you can visit the splendid Borea d’Olmo Palace (at No. 143). The Palace was built in the late-fifteenth century and it has always been owned by the Borea family – a noble family of Venetian origin who was recognised as Marquises of Olmo by the Savoys. The piano nobile houses the Town Museum. Within the museum there are three distinct areas: the archaeological rooms, the legacy of the poet Laurano’s paintings and engravings, and the collection of Garibaldian relics (letters and personal belongings mainly) that once belonged to the English noblewoman Caroline Phillipson who lived in San Remo and was a friend to Giuseppe Garibaldi. You should not miss seeing the museum vaults decorated with frescoes and the late-seventeenth-century paintings by Giovanni Battista Merano (1632-1698). The main sacred building in San Remo is San Siro Cathedral. It was built in the twelfth century, following a Romanesque-Gothic style and resembling St Michael Cathedral in Albenga. Later the Cathedral was modified according to the Baroque style but was later restored back to its original style between the nineteenth and twentieth century. Its bell tower though could not be restored: it had been cut off by the Genoese in 1753 and was rebuilt following a pseudo-Baroque style. The side portal on the left is decorated with a bas-relief that is the oldest element of the building. The bas-relief portrays an Easter lamb between two palms and it probably dates back to the twelfth century. Inside the cathedral, you can find an eighteenth-century wooden Crucifix by Anton Maria Maragliano over the high altar. The chapel on the right is consecrated to the Sacred Sacrament. Here you will see an important Renaissance sculpture by the Gaggini school, while in the chapel on the left you can find a statue of the Virgin Mary of the Rosary by Maragliano. Along the right aisle, you can see a black Crucifix – by an unknown artist – that in the past functioned as a moral support for the San Remo community in bad times. Next to the cathedral, you will find St John Baptistery that dates back to the Baroque period (ca. 1688). Here you can see the “Holy Communion of Magdalene” by Orazio de Ferrari. In Piazza Eroi you will find the Torre (tower) della Ciapela. It is an impressive building with one-meter-thick stone walls that was once part of the sixteenth-century town walls. Piazza Eroi is in the town centre and close to La Pigna – the Medieval part of the town. La Pigna is perched along the hill and is closed by walls, doors, and towers. This part of the town is characterised by stone buildings with many columns, engraved portals, and arches that connect one house to another.